The ideal way to achieve a perfect colour combination. Hassle-free gardening at its finest. This mixture of jumbo plugs is sent at just the right stage to pot on. We’ve hand-picked the perfect colour combination for you so there's no need to worry about whether they complement each other – just plant them up, water them and enjoy the display! Guaranteed to give you a fabulous display all summer. 'Eton Mess' plugs are supplied as a mix of 12 plugs of Petunia, Calibrachoa and Verbena. 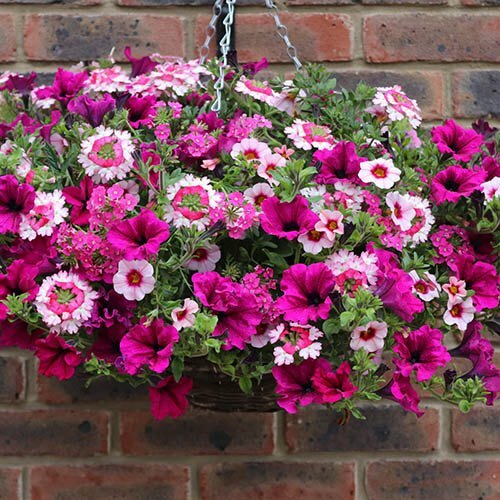 Just imagine, the perfect way to achieve stunning baskets and containers this summer, with minimal effort on your part! If you've wanted perfect pots and creative containers full of colour, but don't know where to start when it comes to picking complementary plants, then our Eton Mess plug collection is the ideal solution. We've hand-picked the best plants for you, carefully choosing varieties which blend together in harmony to create fabulous displays. Just like its delectable dessert's namesake, this sumptuous collection of Petunia, Calibrachoa and Verbena brings shades of pink and purple to your garden in a sizzling display of opulence. Full trumpets of Petunia merge happily with the smaller blooms of Calibrachoa and vibrant Verbena blooms in a spectacular summer show. You'll receive 12 Jumbo Plug plants in a mixture of the following: Calibrachoa Calita Pink, Petunia Pegasus Purple, Verbena Samira Pink Wing. Calibrachoa's small petunia-like flowers add a delicate feel. The pink blooms have a cerise throat with a yellow middle, and appear from mid-summer to the first frosts, making them a long-lasting and colourful addition to baskets and containers. Petunias always make a statement in summer arrangements and their fragrance is unmistakable as you pass by. With their glorious purple velvet trumpets, they're an absolute must-have, blooming from May through to October! Verbena adds a little touch of the exotic with their trailing fragrant foliage and clusters of pink star-shaped blooms. Flowering from June to October their mounds of flowers help fill out the whole arrangement. Supplied as 12 jumbo plug plants in a mixture of Petunia, Calibrachoa and Verbena.